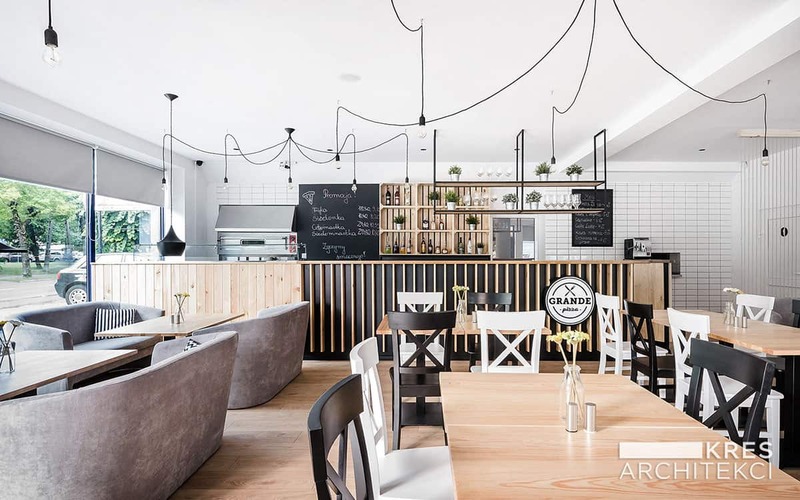 Kres Architekci’s main idea of the Grande Pizza Restaurant was to create a place with intimate climate for the first truly Italian restaurant in Tomaszów Lubelski. Natural materials of finishings are combined with strong accents of black. We wanted to mix different textures and finishes. We also combined unobvious details, such as jute twines as a partition by the sofas. In the evening, the warm light of Edison bulbs creates a unique atmosphere. We also designed a kid corner: the largest attraction for children is the wooden house, where young artists can play and put their masterpieces on the wall, using chalk. As a continuation of interior design, we also designed the whole branding company, such as logo, menus and leaflets. We are not trying to compare ourselves to the other artists, we are just trying to do our job properly and we are focused to improve our individual style. We can describe our style as reasonable minimalism. We pay a lot of attention to the rich details and textures. We don’t have inspirations in persons. We respect the work of other architects, we admire it, but we are trying to find inspirations in real life here and now. Our advice to aspiring artist is to keep doing what you believe in. If it’s good it will always defend itself. Qualitative, timeless design with strong idea will always be good solution. Kres Architekci young architects, for which designing is passion. “Our team was awarded in many architectural competitions, part of which was completed. The experience gained in the largest studios in Poland, allowed us to develop the highest quality of services, supported by high technical knowledge and unconventional approach to the design. While designing, we are always looking for a clear idea, which refers to the place and responds to the expectations of an investor. We think architecture is not only building with its parameters, such as building area and curvature. For us, architecture should be always considered through the prism of a human an its needs.” See more of their works on their website.